Bozworth had an incredible spirit, intelligence, beauty and health. I met Bozworth at the animal shelter. At three months, he’d been adopted and then returned to the shelter. He had a little 12-pound body and BIG paws. My vet predicted he’d grow to 100 pounds, and he was right—and his energy! I told my Mom I wasn’t sure about a dog with all that energy. She said, that means he has personality. He came home with us that day; we had no idea how much he’d bring to our lives. Bozz soon adjusted to his new home. He started puppy school at four months and learned quickly; he understood a large vocabulary. We ensured he had lots of exercise daily, rain or shine, and he expected it. He loved wrestling with my husband, and Bozz had lots of friends. Bozz wasn’t allowed to leave the front lawn, and Whitey, a neighborhood dog friend, loved to taunt Bozz from the sidewalk. Bozz would drag Whitey by the tail onto the lawn to play. Bozz always knew how to get to all his favorite places, parks, etc. One summer evening, Bozz decided to go visit his best friend many streets and miles away. They had been meeting for swim dates regularly with us at the lake. Thank God we found Bozz sitting on his best friend’s door-step soon after. We were shocked that he knew how to get there with all the streets and turns. He loved putting as many balls in his mouth as possible. He’d roll on his back, hold his ball up with his paws, then drop it into his mouth. He was always so happy! We saw his strong will develop; he brought this light to everyone around him. Bozz became so handsome; people guessed him as Lab/Dane and would say he was human-like. We traveled with him regularly, and he lit up when he saw our bags. His passion motivated us to explore many places…lakes, rivers, redwoods, especially the ocean. We taught him to swim and he would swim as far as you could throw a stick or ball. When we swam, Bozz watched us closely. He could tell when the water got too high, and would cry, dive in the water and drag us ashore. He felt swings were dangerous for us, too. When we got near a swing, he ran over and dragged us off. His enthusiasm made us stop and experience the moment. We have so many rich memories. As Bozz got older he continued to be a puppy in an older dog’s body. 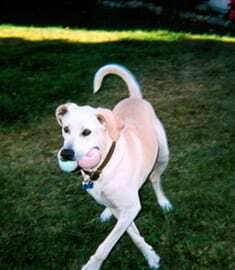 At 13, he swam and played regularly with younger dogs, chasing sticks and playing with his toys with the same enthusiasm as when he was a puppy. His vet said he’d been doing this 20 years, and he rarely sees a dog this happy and act this way at that age/size! He’s truly one-in-a-million! I was told that with his size, if he got to age 10, we’d be lucky. Bozz made it to almost age 15. Bozz had that energy and will until the last few months in 2004. I knew long ago how special Bozz was. In 1998, I started going to the library and reading about Missy and the Missyplicity project. I continued to keep in touch with Lou Hawthorne at Genetic Savings & Clone, then BioArts, and learned about ViaGen. We gene-banked Bozz’s DNA in 1999 with Canine Cryobank and again in 2004 with ViaGen Pets. The memory of Bozworth’s incredible spirit and the love & joy he gave us will live on in our hearts forever…. We hope to experience a part of our best friend again.